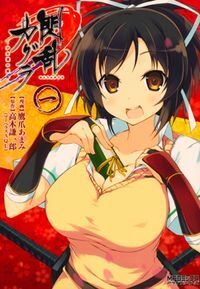 North American manga publisher Seven Seas Entertainment, the same distributor for printed versions of A Certain Scientific Railgun and Toradora!, has added the manga adaptation of Senran Kagura to its spring line-up. Under the title Senran Kagura: Skirting Shadows, the manga series is created by Anami Takatsumi, and will see a North American release later in November this year, followed by the second volume that will be releasing in March 2014. Each volume will cost $12.99. There is also an animated series that had just finished airing not long ago, and can be viewed at Funimation’s simulcasting site and YouTube channel. Things are looking pretty good for Senran Kagura fans right now, with the possibility that the anime series will be released on DVD, followed by the English distribution for the manga. All that’s left now is seeing the games get released. And if there’s enough demand and support by the fans and publishers alike, then perhaps the Senran Kagura games may see a Western release. Let’s just hope the publishers are willing enough to let it happen. To help support Senran Kagura and its international release, visit Senran International Academy at our Campaign Hub! If you want to learn more about Seven Seas Entertainment and its manga line-up, CLICK HERE.